Ah summertime....almost....:) My family and I enjoyed our first campfire with Smores a couple of nights ago. Such a wonderful time watching the boys play Pirate-Robots and imagining that they were "off to save the day!" My husband and I laughed and laughed as they tried to use sand shovels to "row" their "boat" (camp chairs in the lid of their sandbox) tooo funny. Wish I had my camera out for that one. David and I sat by the fire, sipping a beverage and roasting marshmallows. It was such a great night! Summer beverages....I love them all! Gotta stay hydrated....and just drinking water can be kinda boring...SO...Throughout the summer I make big jugs of sun tea, juices, iced coffee, and of course....lemonade! I love Lemon lemonade, Vanilla Lemonade (see my post on that one! ), and a new favorite....Strawberry Lemonade! Yes it sounds fancy schmancy.....but it is soooo easy to make! A lovely sipper on a hot day. 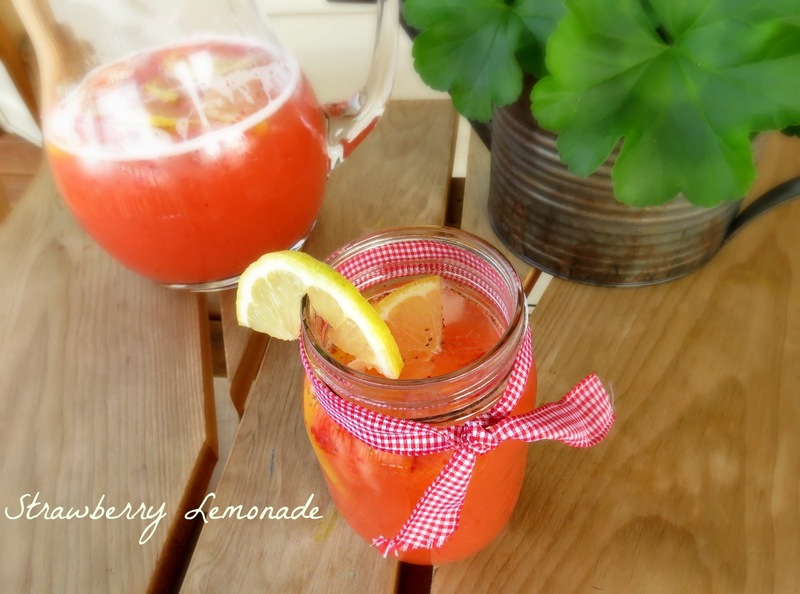 The strawberries sweeten up the drink, yet the lemons make sure that there is still that tang that everyone loves. My William LOVES this drink! In a saucepan over high heat, mix together the water and the sugar. Cook until the sugar dissolves and it becomes a clear syrup. Remove from heat and set aside to cool. Add the strawberries and the 1 cup cold water to a blender. Puree. To a half-gallon (2L) pitcher, add the lemon juice, 1 cup cold water, ice, and lemon and strawberry slices, if using. Stir in the strawberry puree and the simple syrup until well combined. Taste for sweetness and add more cold water if needed. Refrigerate to chill through or serve over ice. You can strain the seeds and pulp out if ya like. We like our "thick". Also, try adding some sparkling water to add some fizz. Any way you try it this is a good drink!!! I am a stay at home mom who doesn't stay at home all the time. I enjoy cooking good food for family and friends, taking my boys to their activities and drinking fine wines with my husband in the evenings. It's a good life!